New York City. This is the building that’s right behind me here and you can see the other building reflected on the right side of this one. 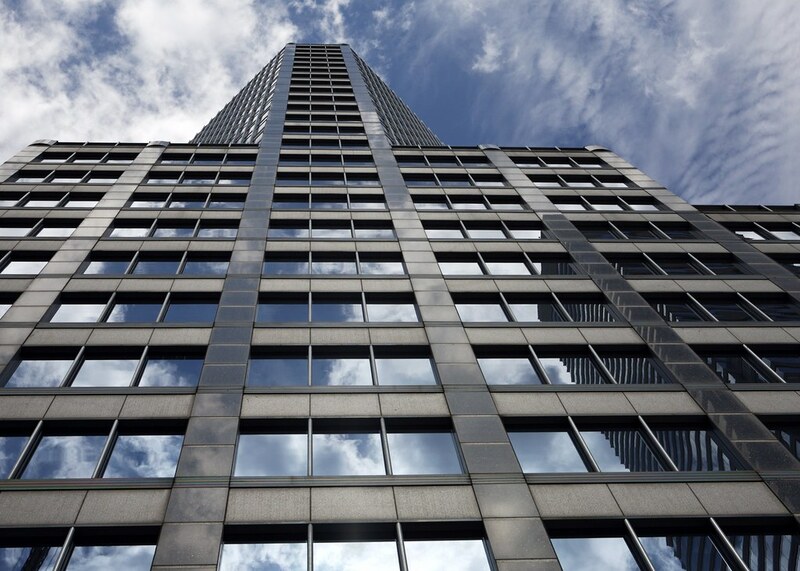 An interesting aspect of large glass buildings in tight surroundings is how they interact visually and spatially with the buildings around them as well as the sky. In order to see this visual interaction one has to pause long enough to take it in. Here is the view up from just outside the main entrance of this major building and I stood here for five minutes, both composing this shot and looking around. I didn’t see one of the dozens of people walking in and out of the building look up. Of course, they might have looked up yesterday, but the sky wasn’t this nice yesterday. Maybe only tourists and photographers see this stuff; to regular folk who live and work here it’s just part of the everyday landscape which is a means to another end, not an end in itself.